"I got this simple yet delicious recipe from a lady named Elaine, who I work for. I work in a kitchen of a country club and this is one of many desserts that they serve, and by far my favorite! 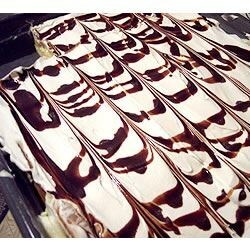 Drizzle with chocolate syrup and use a knife to make a design." Preheat oven to 400 degrees F (200 degrees C) and lightly grease a jelly roll pan. In a large saucepan, bring water and margarine to a boil. Remove from heat, and mix in flour with electric mixer. Add eggs, one at a time, beating well after each. Spread evenly in prepared pan . In large bowl, combine pudding mix, milk and cream cheese. Mix with electric mixer until smooth. Spread evenly over cooled crust. Top with whipped topping and drizzle with chocolate syrup. Chill in refrigerator and serve cold. Made this, posted a picture of it. Pure delectable deliciousness!! An inside out, upside down eclair/cream puff. Oh my goodness, EVERYONE should make this. What a way to impress your friends and family! It's got a great flavor, very gentle and elegant. If you like cream puffs, you will love this recipe.